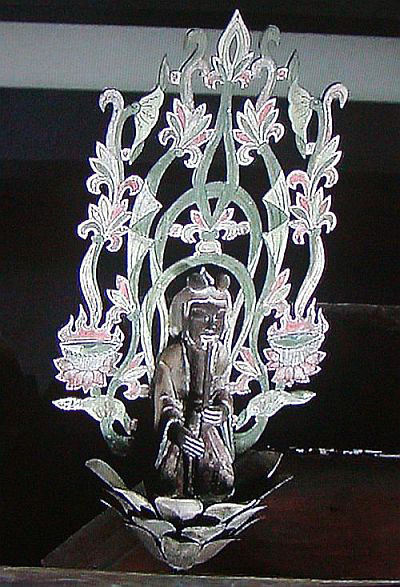 in The Gallery of Hōryū-ji Treasures, Tokyo National Museum. 7th or 8th century AD. as well as traditional Japanese shamanism. 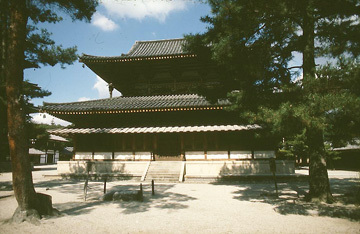 Wakayama Pref., founded by En no Gyōja. Maker and date unknown. Important note: This anecdote is apocryphal. The "incident" certainly never took place, so to speak! 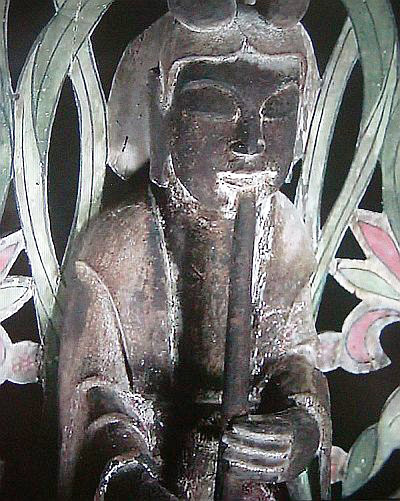 "At times when Ennin could not hear clearly, he used a shakuhachi in order to chant the Amida Sūtra. If he did not manage to chant the passage '... an ideal environment so that whatever one lays eyes upon will bring about awakening',* he would usually place himself by the 'Dragon and Serpent' pine wood doors of the temple hall, and when he had stopped blowing, there was a voice in the middle of the empty sky proclaiming, 'Raise the ya note', and so forth. Consequently, the ya note had to be raised." 1160-1215. Trsl. by Torsten Olafsson. Source: Koji ruien. This anecdote is quite probably apocryphal. Do note that Ennin was a Tendai monk, not a Zen monk. Ennin would have employed the instrument mainly for intonation. This anecdote is also reported in the Taigenshō of 1512. "Shariputra, this land of Ultimate Bliss is an ideal environment so that whatever one lays eyes upon will bring about awakening." Translation: Jodo Shu Research Institute, 2003.
" - - - Here in the excitement of the coming fête were assembled several young nobles, in addition to Genji himself. Some practised dancing, others music, the sound of which echoed everywhere around. 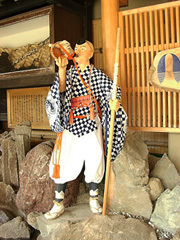 A large hichiriki and a shakuhachi were blown with the utmost vigor. Even large drums were rolled upon a balcony and beaten with a will. - - - "
"Saffron Flower". Trsl. by Suematsu Kenchō, 1977. "In an old Zen story it has been said that a certain monk named Kakua was asked to appear before the Emperor and explain the essence of Zen. Kakua arrived at the court and stood quietly before the Emperor and all his esteemed advisors and courtesans who had all gathered to hear this renowned teacher. After standing for a long period in silence, during which time the court grew agitated, Kakua removed a bamboo flute from the folds of his robe, blew one short single tone, bowed politely and left. He returned to the mountains where he was seldom heard from again." Important note: This anecdote is apocryphal!
" 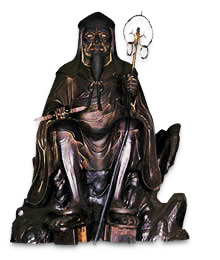 - - - In the Kaō Period [1169-1171] the Emperor [Takakura, r. 1168-1180] heard of [Kaku-]a's Zen practice. [He] summoned [the monk to the court] and inquired about the essentials of the sect. [Kaku-]a - [who by his] side [was carrying] a flute - blew it in response to the Imperial command. The times not yet being ripe, the Emperor and his retainers did not fathom [the essence of Kakua's teaching]. Regretful indeed! [Kakua] left and was not heard from [again], was he?" 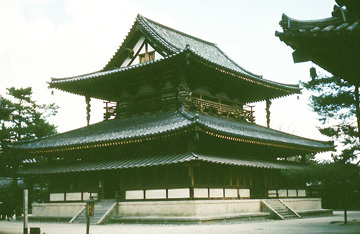 1278-1346, completed in the second year of the Genkō Period: 1322. Born in 1142, Kakua first studied Tendai Buddhism on Mt. Hiei. 1103-1176, at the temple Ling-yin-ssu in Hang-chou, S. China. Hui-yüan's master was the famous Yüan-wu K'o-ch'in, 1063-1135.
to Japan and spent the remainder of this life as a recluse on Mt. Hiei. most probably a transverse flute - not a shakuhachi. 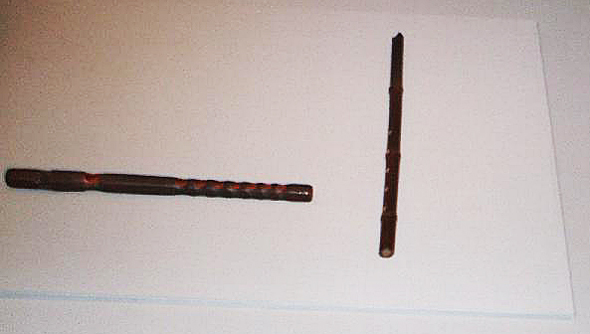 the Shōan, 1171-1175, and Angen, 1175-1177, periods. Baroni, 2002, p. 173; Zengaku Jiten, p. 170. Baroni, Helen Josephine: The illustrated encyclopedia of Zen Buddhism. Printed Matter Press, Tokyo, 2008. Cornell University, 1988. Pages 102-131 & 268-271. Victor Sōgen Hori: Zen Sand. The Book of Capping Phrases for Kōan Practice. University of Hawai'i Press, Honolulu, 2003. H. Mack Horton: The Journal of Sōchō. Translated and annotated by H. Mack Horton. Stanford University Press, Stanford, California, 2002. In: 'Research reports of the Kōchi University. Humanities'. ("Setsuyōshū in five versions rearranged and compared"). Kikan hōgaku 5, special issue: 'Shakuhachi no miwaku'. Ongaku no Tomo-sha, Tokyo, 1975. Reprint by Seikōkan Shuppanbu, Tokyo, 1933. Koji Ruien. 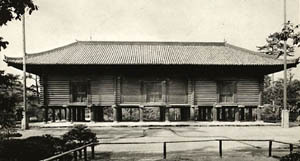 Ruien Kankōkai, Tokyo, 1896-1914. Reduced size reprint ed. Kōbunkan, Tokyo, 1967-1971. Vol. 9: Section on Religion. Vols. 32 & 35: Sections on Music. Kraft, Kenneth: Eloquent Zen: Daito and Early Japanese Zen. Ph.D. thesis, University of Sidney, 1992.
ment. Buddhist Books International, Los Angeles, Tokyo, 1974, 1976. NKDJ: Nihon Kokugo Dai-jiten. Nihon Dai-jiten Kankōkai, Tokyo, 1973-1975.